I have been away from my blog for a few days now. Well it’s not because I have been lazy, it’s more because I have had too many things happening all around me. Just never found the time to get to my blog. Also, Amit and I celebrated our third wedding anniversary last week. But am back now. Last week we bought a lot of fish and I really needed to finish it before it got stale. I remember seeing a fish recipe which had some potatoes in them, so thought of doing just that. Though I do not remember the recipe but the idea of putting fish and potatoes together in the same dish intrigued me. For the red curry sauce I made a few changes to the recipe I found at a website which I have linked at the end of my blog. 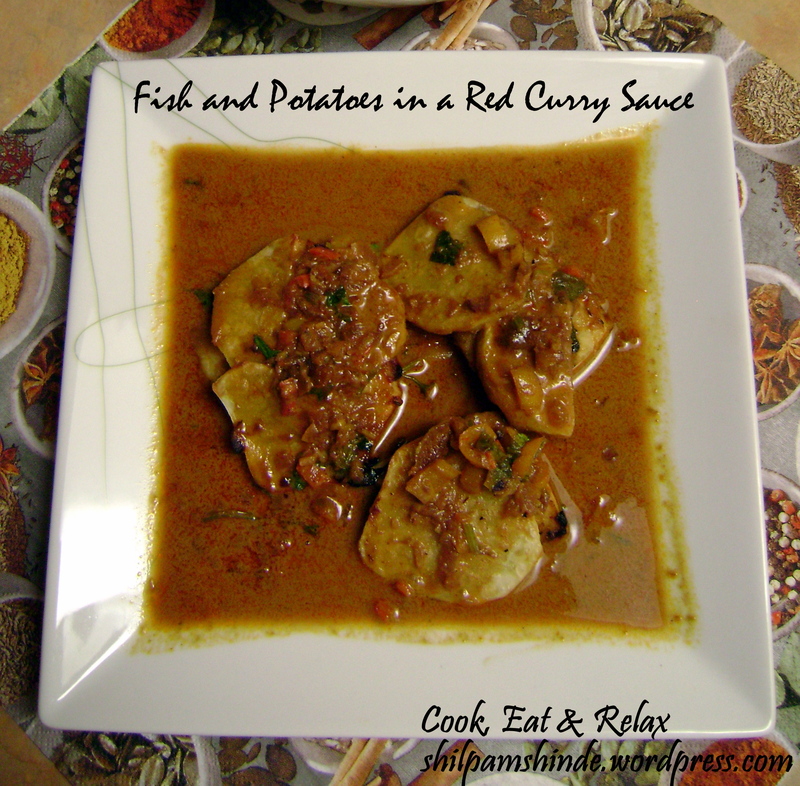 So here’s my own version of fish and potatoes in red curry sauce recipe. Marinate the tilapia fillets in some salt and 1/2 teaspoon black pepper (freshly ground) for about 15 minutes. Heat the broiler in the meanwhile. Slice the potato into really thin slices. Broil the fish fillets on one side for about 10 minutes. Turn the fillets over and place the potato slices on top of the fish fillets. Broil this side for about 5 minutes. Once the potatoes start turning brown, turn over the potato slices. Once this side also browns set aside the fish and potato slices. Add the ginger and garlic and saute this till it turns light brown. Add the onions and fry it till it turns light brown. Now add the sweet pepper and cook till the pepper is soft and cooked through. Once the pepper is cooked, add the cumin powder and curry powder and saute for a couple of minutes. Then add the soy sauce, brown sugar and curry paste and stir till the mixture is homogeneous. Add the lemon juice and chopped cilantro and stir it. Now remove the sauce from heat. To serve, place the fish fillet in a plate and pour the red curry sauce over the fish fillet. I cut the fillet into smaller pieces just because it’s easier to serve. This serves two persons and does make some extra sauce. I was able to use the leftover sauce, the next day, with some boiled eggs. 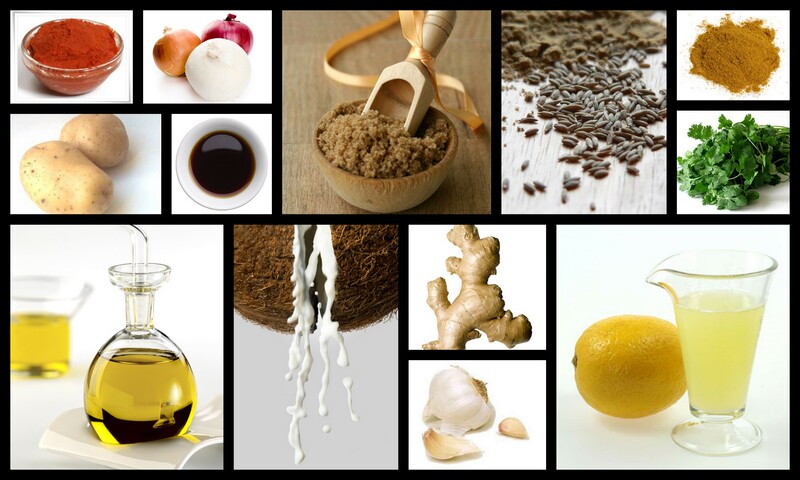 The entire recipe takes about 45 minutes from start to finish. And here is the original recipe for the red curry sauce http://find.myrecipes.com/recipes/recipefinder.dyn?action=displayRecipe&recipe_id=10000000348346. I did make some changes to suit my taste buds. Hope you enjoy this recipe as much as I did. You can make the sauce and use it as a topping over any other vegetables / meat. We loved this sauce over the boiled eggs as well. This entry was posted in Main Course and tagged Coconut Milk, Curry, Fish, Fish and Potatoes in a Red Curry Sauce, Potato, Red Curry Sauce, Sauce, Tilapia. Bookmark the permalink.